Toy Train Revue On-line is a webzine for both the collector and operator of toy trains including Lionel, American Flyer, Ives, MTH, Williams, Marx, Weaver, 3rd Rail, K-line and Atlas O. Features include in-depth interviews, news in the hobby, layout building tips, product reviews and more. When the New York Central unveiled the Commodore Vanderbilt streamlined Hudson in 1934, something new was presented to Depression-weary America. The idea caught the fancy of the public, and the other railroads, and started a significant movement in the country for modern-looking transportation. Industrial designer Henry Dreyfuss' was 34 when he was awarded his first job for the New York Central: design The Mercury, which would be called "The Train of Tomorrow." In his book Designing For People (Simon & Schuster, 1955), Mr. Dreyfuss recalls the major effort his office undertook in designing the train, and how it almost never came to pass, so to speak. "The final designs were approved by the late Fred Williamson, president of the New York Central, but when they were put out for bid the prices were so out of line that the project was cancelled." "It was a heavy blow when I received the bad news...I had decided to take the rest of the day off, and I boarded a train for the country. En route, traveling through the railroad yards at Mott Haven, I saw the answer. I got off the train, returned to New York, and suggested to President Williamson that some of the unused cars in the yards might be converted." And converted they were -- at one quarter the original figure. As Mr. Dreyfuss points out in his book, the Mercury was the first streamliner to be done "as a unit, inside and out, integrating everything from locomotives to dinner china." New York Central shrouded two 4-6-2 K5 Pacifics. One can detect a slight relationship with the Commodore Vanderbilt's lines. Decorative enhancements included horizontal lines across the pilot skirt and unique disc drivers which were illuminated. At night, the glowing wheels made a lasting impression on those who got to see her run by. Now, finally, more than sixty-five years since she was christened, an exquisite model of this train is available from 3rd Rail. 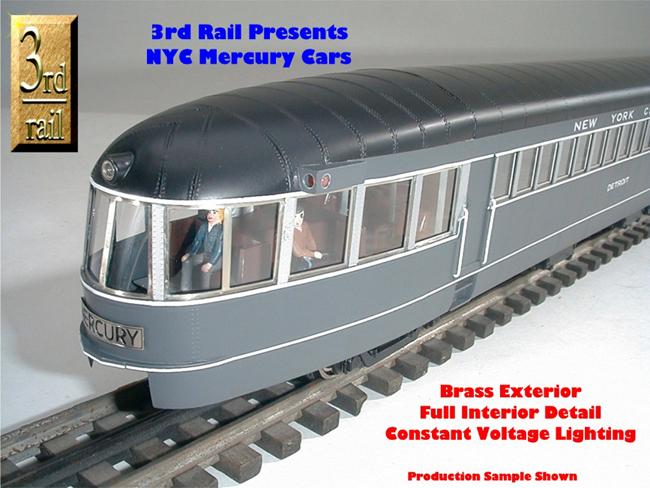 The 3rd Rail model captures all of the aesthetic magic of the real New York Central Mercury. The locomotive is made of diecast, which is sturdy and adds weight to the engine, thereby aiding the tractive effort. While brass locomotives traditionally have more details than diecast, a streamlined shrouded engine such as the Mercury doesn't lose anything by being diecast. There's still a lot of separately-applied enhancements such as side-view mirrors and brake shoes on the locomotive and tender. The illuminated drivers are sprung and the engine ran smoothly, easily pulling the tender and four scale cars while riding on Atlas O-72 track. Minimum diameter curves for this engine are 54-inches. The locomotive comes with Lionel's TrainMaster Command Control and RailSounds. Other features include back-up light and ElectroCoupler on tender, and Seuthe smoke unit on locomotive. In an age where there are so many different smoke units, (ranging between great, good, and weak) the smoke that the Mercury produces is good. The TowerCom sound feature for non-Lionel locomotives is not "personalized" for specific engines. Accordingly, there's no mention of New York Central or Mercury in this model's TowerCom. According to their website, 3rd Rail has produced 425 3-rail locomotives and 75 units for 2-rail. The 2-rail versions are sold out. When I first saw the locomotive, I questioned the white drivers which I thought were aluminum. 3rd Rail assured me that their extensive research concluded that the stripes, handrails and drivers were white. More importantly, they reasoned, no New York Central aficionado has questioned the white. That was good enough for me, because Central fans are like Chicago sports fans. Neither is shy about letting management know when they don't get something right. The cars are made of brass. Somehow metal passenger cars look metal, even with paint on them, and plastic cars look plastic. Brass doesn't allow for very strong rivet detail. But, as you can see in some of the pictures to the left, the simulated rivets sufficiently stand out. Brass does allow for thin details, such as on the car end. If molded in plastic, this area would have to be thicker and bulkier in order to prevent breakage. The cars modeled are the 1001 combine, 1002 coach, 1003 parlor-kitchen car, and the Detroit observation car. What's nice about the first three cars is that they are in immediate numerical order. Sometimes manufacturers will choose random cars from a consist, and so you'll have skipping numbers, which doesn't look as good. The colors and stripes match between the engine and cars, and the Mercury medallions on the sides look great. The observation car has the signature tall windows accurately re-produced. Imagine sitting in the best seat on the train in 1936, looking out of these huge windows at the Midwest as you travel through. The lighting is constant voltage, and there are enough bulbs to evenly cast a medium glow throughout each car. I particularly like the recreation of seating and compartments. This is a train you'll wish you could actually walk through and ride in. Thanks in part to the book New York Central's Mercury by Richard J. Cook, Sr. (1991, TLC Publishing, Inc.), 3rd Rail had a lot of vintage photographs and authentic floor diagrams to aid in researching this historical train. There is a striking amount of detail under the cars. Pipes, generators, steps, etc. are all intricately modeled. This was really going the extra distance. One can imagine an owner proudly showing these features to visitors. The trucks have spring detail and look great partially covered by the skirting. As spectacular as these cars are, are they perfect? Not quite. There are a few minor concerns I have with the observation car, which is the most important car in the consist. First, the nameplate is not illuminated. It is a separately-applied polished metal piece. The reflectiveness of the metal can certainly catch light and at times give the impression of illumination, but if you run the train in a nighttime setting, you can't see it. Secondly, there is no coupler on the end. A big fat toy train coupler could very well wreck the stylish look of the sloping rear, which would be like listening to a relaxing overture that ends with a pile of glass crashing to the floor. Besides, who really ever couples anything to the end of an observation car? But for appearance a scale coupler would have been ideal. Finally, the handful of people in the back sort of detract from the pureness of the cars as models. I can see where having no people in this area might look too empty through the gaping windows, but I think having the few people here amplifies the absence of people throughout the rest of the train. One nit-pick I have with figures in these old cars (from any manufacturer) is that they look like they boarded the train at a railroad museum. Prewar fashions had more formality, including hats, coats and ties. If you're going to model cars from a certain period, why not model the people from the same period? Plasticville figures (although there's only one or two sitting down) is along the lines of what I am talking about. These points aside, I am very pleased with this train. I would go so far as to recommend it beyond the hobby to the community of NYC Mercury collectors out there who buy items such as dinner ware, matchbooks, and playing cards. With this model, you really get as close as you can to seeing the real Mercury ride again.